We adapted Creating Teaching Tools to provide you and other teachers with practical strategies that we know to be successful in helping young children with problem behavior. These strategies come from our research activities and experiences in Positive Behavior Support. Click here to find more information on the development of the teaching tools. The Teaching Tools are designed to provide easily accessible ideas and materials so that you can support children in the classroom and other learning environments. We have tested the strategies offered by Creating Teaching Tools through a pilot study that focused on helping children with developmental delays and problem behavior as they transitioned into public school early childhood special education classrooms. The User's Manual provides an overview of the entire contents of the Creating Teaching Tools materials. It presents steps to take in using the materials to support young children in the classroom and other learning environments. The manual also provides the following guides and tips for mental health consultants: Steps to follow in using a decision tree for intervention using Teaching Tools; tips for facilitating family partnership; a sample letter to family; developing a consultation plan; supporting teacher during implementation of the support plan; and monitoring child progress and evaluating the plan. Getting Started section provides tips sheets, reproducible forms, and guides as tools to assist in gathering the necessary information prior to strategy selection and during implementation of supports. A variety of basic suggestions designed to assist early educators and caregivers in strengthening the social and emotional competence of the children in the classroom. Ideas for how to provide directions and guidance to children in a manner that is positive and supportive of appropriate behavior. A questionnaire designed to help early educators and caregivers gather information from the family about the child's strengths and challenges in the home and classroom. A checklist designed to identify child's needs for engagement in routines, play and social interaction skills, communication skills, and challenging behavior. A checklist designed to help mental health consultants and caregivers assess child behavior in relation to classroom events. A simple form that provides an easy way to track challenging behavior and child engagement in the daily routines of the classroom. A simple behavior support planning sheet to list the strategies selected to support child within problematic routines. A sample rating scale designed to record the child's target behaviors and skills within problematic routines or activities that might be used to track the child's progress. A checklist for caregivers to self-record their implementation of the behavior support plan or strategies. The Routine Based Support Guide includes strategies for 12 common classroom routines or activities based on problematic situations and the purpose of the problem behavior. The guide provides the strategies for preventing and responding to the problem behavior as well as identifying the new skills to teach. This folder contains Buddy System Tip Sheet and “You've Got to Have Friends”, an article about peer buddies. They provide ideas for using a peer buddy system to support the child with challenging behavior while adjusting to the new setting. Teacher Tools contains visuals that help children understand common classroom rules and what areas are off limits (i.e., stop signs). The Turtle Techniques is a method of teaching young children a strategy for coping with anger, disappointment, and frustration. This folder contains an article about anger control, visuals for the turtle technique steps, and a scripted story. This folder provides a rationale and key points for using the visual strategies. Visual schedules, choice boards, cue cards, and activity sequences with a variety of pictured examples are provided to help caregivers develop their own visual supports. This folder contains Scripted Story Tips. Scripted stories help children understand a social situation by describing the situation, what the child needs to do, and how others feel when the child exhibits the inappropriate behavior or desired behavior. The Circle Time Tips focuses on visual strategies for helping children understand circle time. The folder includes a scripted story about circle time, rules for circle, and a mini-schedule for understanding and predicting the activities of circle time. The Feeling Vocabulary folder contains an article about enhancing young children's emotional vocabulary. The article provides a variety of strategies to support children around the notion of appropriately expressing feelings. Some of the ideas discussed in the article are also provided in this folder: visuals depicting a variety of emotions, a feeling wheel, and a feeling chart. The Home Kit contains strategies and information the teacher can share with families. The folder includes “My teacher Wants to Know”, a questionnaire designed to offer critical information about the child. A scripted story, “I Go to Preschool” is provided to help children with first time transitions to school. A visual mini schedule, “Getting Ready for School” and a tip sheet, “Use Positive Words” are provided for parents to get the child ready for school and to communicate in a way that supports the child's success. This folder provides folder labels and binder inserts. The labels and binder inserts provide a way to organize the materials. 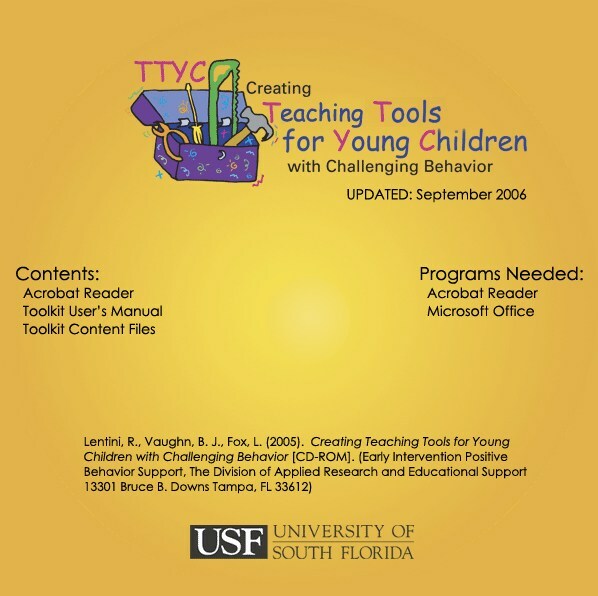 The Creating Teaching Tools for Young Children (TTYC) was a product originally developed by Bobbie Vaughn, Rochelle Lentini, and Lise Fox of the University of South Florida to provide practical guidance on how to support young children with challenging behavior. It has been disseminated since 2004 through support from the Office of Special Education Programs (grant # H324Z010001 and #H326B070002). Through the current funding provided by the Office of Head Start, we have expanded and updated the TTYC by providing more detailed information on the use of TTYC, adding strategies for toddlers, providing a decision-making tool for determining the support a child might need, and offering specific guidance on how mental health consultants in Early Head Start/Head Start could use these tools with Early Head Start/Head Start teachers, staff and families. Lentini, R., Vaughn, B. J., Fox, L., & Kwang-Sun Blair (2009). Creating teaching tools for young children with challenging behavior (3rd edition). Tampa, Florida: University of South Florida.